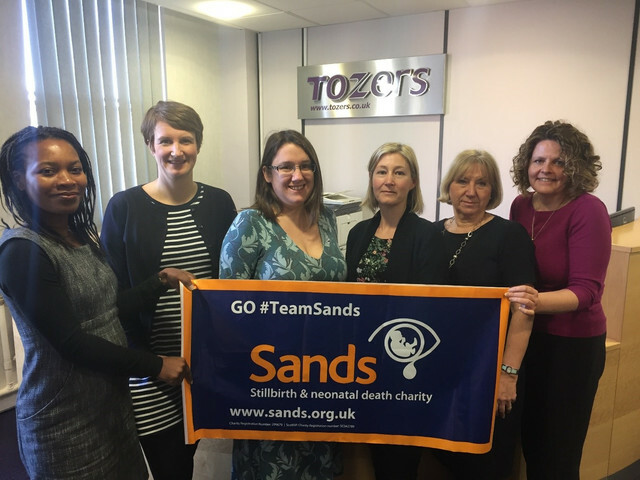 Lynda Richards works for Tozers, a firm of solicitors who chose Sands as their Charity of the Year for 2018. This is her story of baby loss. "I am writing this as a grandmother whose daughter lost her baby boy, Ethan last year at 21 weeks. My grief is not only for my lost grandson, but also for my daughter's distress. "My grandson was tragically lost on a Friday, I called my friend at work in tears in the morning to tell her that the consultant said that it was too soon and nothing could be done to save him. My friend informed HR. I knew that I would be given paid compassionate leave for the day. I called my colleague friend on the Saturday morning to tell her that we lost him on the Friday night. We cried together and she gave me the reassurance that she and all at work were there for me. "I only work Wednesdays to Fridays, so I was able to spend the next few days visiting my daughter Jane, her partner Kevin and Ethan in the Heartsease room at the hospital. "I was concerned that I wouldn't be strong enough to return to work on the Wednesday, but I decided to go into work on the Tuesday to see my work team and HR to get their support and to thank HR for the beautiful flowers that were sent to my husband and myself. Everyone, stopped their work and listened when I told them what had happened and were sympathetic and expressed their sorrow. One colleague told me that his sister had lost her first baby and went on to have two healthy children. He also told me that his sister's family still mark the baby's birthday every year. I received lots of hugs that day and I felt stronger about returning to work the following day. I advised my daughter Jane to do the same as it softens the impact of the return to work day. "The next day at work I told other colleagues that knew that Jane was expecting, that she had lost the baby and showed them a photo of Ethan. He was lying in the crib, with a blanket over him and he had a hat on. He looked just like a very tiny sleeping newborn. "Everybody expressed their sorrow and looked at his photo. I think one male colleague was a little uncomfortable, but tried not to show it. The photo sits on my desk to this day. A few friends bought me flowers with messages expressing their sadness, which comforted me. "The managing partner, who is also my line manager made a point of expressing his sadness to me and asked if I needed more days leave. I found out from HR that he instructed the flowers to be sent to me before I returned to work. I was especially touched by this. I only received one comment from a colleague which took me by surprise, knowing the person I don't think that she meant to be uncaring, she probably thought that she was being positive. She said that when Jane gets back into her work, she'll move forward and get over it. "I wasn't directly offered counselling through the firm as I had not requested it and, HR did not detect that I needed it, but it was there should I have needed it. "After Ethan's funeral, colleagues asked how the day went and how Jane and Kevin handled the day. Yes, there were tears, but their strength truly amazed me. I told my managing partner how afterwards, back at the house the two families were exchanging family stories, to which he replied that we have these ceremonies for a reason and they are part of the healing process. That's twice he's surprised me with kind words or deeds. "As Sands is my firm's nominated charity of the year, I emailed all staff the baby blanket knitting patterns for Sands Memory Boxes. I have received seven to date, with the promise of four more. I would like to think that a few of these were knitted because they knew my daughter Jane and wanted to show tangible support. "Over the weeks and months colleagues have asked me how Jane is getting on and are delighted to hear that she is expecting again. One, who I don't see very frequently asked just two weeks ago, and when I said that she is now 25 weeks, he went on to tell me that his brother was born at 25 weeks and is now a 6 ft strapping young man. "No doubt all will rejoice when her new baby is born and enjoy the cake and to see the pictures." Employers can make a vital difference to the lives of bereaved parents. We are working with companies and organisations throughout the UK to help them support employees who have experienced baby loss. As part of our Finding the Words campaign we want to help employers put in place effective and meaningful support for staff affected by the death of a baby. It is vitally important that companies work with Sands to help raise awareness and get people talking about baby loss. Partnering with Sands, is a great opportunity to engage your employees and customers and support the work we do to reduce the number of babies who die and support anyone affected by the death of a baby. If you employ staff or work in an HR department at a company or organisation, we would love to hear from you. If you are a bereaved parent, we are here to support you in a way that works for you. Please visit our support section to find out how we can help.